Eggplants are in the Solanaceae, or nightshade, family, along with tomatoes, peppers, and potatoes. 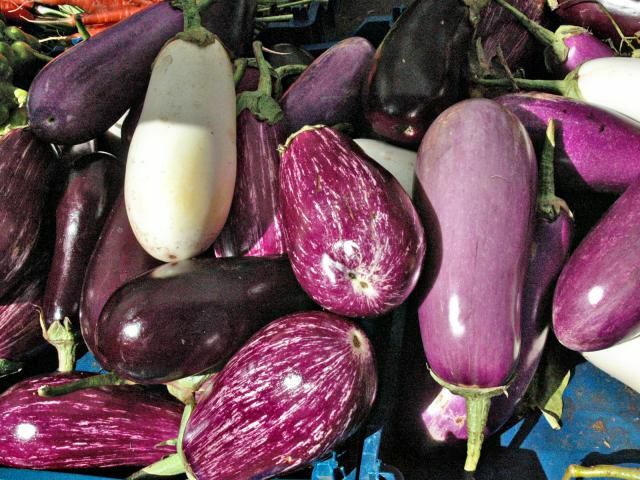 Many of us grew up thinking of eggplant as large, somewhat oval-shaped, purple vegetables. There wasn’t a lot of variety in what we could grow or how we ate it. Thankfully, that is no longer the case. You can now find a wide variety of plants with fruits of different shapes, sizes, and flavors, including many with less bitterness than you may be used to. True to its name, eggplant (Solanum melongena) actually does come in a small, white, egg-shaped variety. There are also yellow, green, and striped eggplants. The flavors are all subtly different, and some are much easier to grow than others, which means the gardener has a lot of options. Leaves: Eggplants (also known as aubergine or melongene) are coarse plants with spiny stems. The leaves are generally lobed and about 4 to 8 inches long. Flowers/fruits: Flowers can be white or some shade of purple, with five-lobes. The fruit varies from small and round to long and thin to hefty orbs. Fruits are actually berries, with lots of tiny seeds inside the flesh. Eggplants are tropical perennials, which means they can live for several years in hot, humid climates, such as USDA Hardiness Zones 10 and 11. However, for vegetable gardeners' purposes, eggplants are grown as annuals and thrive most in Zones 5 through 12. Eggplants are heat-loving plants. They need a full day of sun exposure, not just to set fruits, but also to keep the plants warm. Harvest times vary for different varieties, but most eggplants take at least two months to mature, with some taking 70 days or more. Plants can get 2 to 3 feet tall and be quite bushy. The size and weight of the fruits can cause the stems to bend over or break. Ripe fruits will be glossy, with a slight give when you gently press your finger on the skin. Picking fruits before they are fully grown is fine and will encourage more fruit set. It is best to cut, rather than pull, the fruits from their vines. Eggplant stems are prickly, so it's a good idea to wear gloves. Don’t let the fruits get over-ripe. They will be bitter and full of seeds. This also discourages the plant from producing more fruit. Store the vegetables in the refrigerator. They are best used within a couple of days but should last up to two weeks. Don’t cut them until you are ready to prepare them. The flesh discolors almost immediately when it is exposed to air. Eggplants need a moderately rich, well-draining soil. It helps to work in several inches of compost or other organic matter before planting. A soil pH of 6.5 to 6.8 (slightly acidic) is ideal, although the plants are not too particular. Whether you start with seeds or purchased seedlings, give the plants plenty of time to harden off. Transplant them into the garden at least two weeks after your last frost date. Wait longer if temperatures remain cool. There is nothing to be gained by starting them too early. They will not start setting fruits until evening temperatures remain in the 70s F. Space plants about 2 to 3 feet. apart. They will branch out and will need the extra air room. When growing eggplants in cooler climates, you can get an early start by planting in raised beds or containers, or you can pre-warm the soil with black plastic or even cover the plants with a floating row cover, for insulation. (Be sure to remove the row cover when the flowers appear, to ensure pollination.) Another option is to grow the plants in black plastic pots, which get considerably warmer than garden soil, sometimes up to 10 degrees F warmer. Pots also hold their heat longer into the evening. Eggplants can be prone to verticillium wilt, a vascular disease that prevents the plants from taking up water, cause the plants to wilt and eventually die. If verticillium wilt is a problem, choose resistant varieties and avoid planting eggplants in an area where tomatoes or peppers have recently been grown. Growing them in a container with fresh potting soil is a good option. Flea beetles are the biggest insect problem you will encounter eggplant. The beetles chew dozens of holes in the leaves but rarely touch the fruits. The damage is mostly cosmetic, but it does weaken the plants and can spread disease. You can thwart flea beetles early in the season with a floating row cover, but it must be removed when the plant starts setting flowers. Some gardeners place onion peels around the plants to repel the beetles. There are wonderfully delicious heirloom eggplants and some great modern hybrids that are disease-resistant and/or quick-ripening. Experiment with a few varieties to see which do well in your growing conditions. Eggplant has a bad reputation for being bitter. Some varieties are more bitter than others, especially when they are harvested past their prime. Eggplants are related to tobacco and contain nicotinoid alkaloids, which can contribute to the bitter taste, but the amount of this alkaloid varies in different eggplants. Try a few varieties before you give up on eggplant. Hansel: An AAS winner that has become extremely popular. The long, thin fruits grow in clusters. You can start harvesting when the fruits are only about 4 inches long, to encourage even more fruits (55 days to harvest). Gretel: The counterpart to Hansel, Gretel is a long, white eggplant that is also non-bitter and delicious when harvested young (55 days to harvest). Japanese White Egg: This fruit really does look like an egg. The flesh is very dense and sweet, with extremely tiny seeds (65 days to harvest). Listadia di Grandia: A Spanish Heirloom with gorgeous, fat, 7-inch-long fruits that are white with purple stripes and have a very mild, sweet flavor (90 days to harvest). Louisiana Long Green: An heirloom variety with 8-inch-long pale-green fruits that are sweet and tender (100 days to harvest). Orient Express: A great choice for northern climates, this is reliable whatever the weather brings. Its tender, dark-purple fruits are long and slender, about 8 to 10 inches long and 1 to 2 inches in diameter (58 days to harvest). Rosa Bianca: An Italian heirloom that does best in warm climates. The fruits are rounded and creamy white shaded with purple, about 4 to 6 inches long and 5 inches in diameter (73 days to harvest). How Do You Grow Crunchy, Delicious Cucumbers?